A couple of months after Gilkey's 2005 release from prison, I met him in front of 49 Geary Street, a building that houses several art galleries and rare book stores, in San Francisco. It was a September morning and he wore a bright white sweatshirt, pleated khakis, his beige leather sneakers, and the PGA baseball cap. He held a folder, on top of which lay a handwritten, numbered list, his to-do list for the day. "So, how do you want to do this?" he asked. The week before, he had agreed to let me tag along with him on one of his scouting trips, to learn how he selects books. I had suggested going to Goodwill, a frequent haunt of his now that he was persona non grata in most San Francisco rare book shops. Gilkey, though, wanted to take me to Brick Row, from which he stole The Mayor of Casterbridge. I tried to mask my disbelief and hoped he would think of another place. "Are you sure?" I asked. "Wouldn't Goodwill work? Or, if not that, aren't there any other stores you can think of?" Probably sensing my unease, he hesitated. "Maybe they'll recognize me," he said, but reconsidered. "On second thought, it won't be a problem." At home, I e-mailed Sanders for his opinion: Would the owner, John Crichton, whom I had not yet met, be upset or angry that I'd knowingly accompanied a rare book thief into his store? I didn't relish dealing with the wrath of one of Gilkey's victims, however peripherally. "Crichton's a good guy," Sanders assured me and gave me the impression that, as Gilkey had said, it wouldn't be a problem. I was still wary, but too curious to walk away from an opportunity to see Gilkey in his element. What sort of person returns to the scene of his crime? So far, I had come to know Gilkey only through our private conversations. I still had no idea how he behaved out in the world, especially his idealized rare book world. He shared many characteristics of other collectors, but his thieving set him apart in ways that still confounded me—was he amoral or mentally ill? How are such lines drawn, anyway? Accompanying Gilkey to Brick Row was an irresistible chance to be an eyewitness. Also, I had heard that the shop was well regarded among rare book collectors, and I wanted to see it firsthand. Standing on the sidewalk in front of Brick Row, Gilkey said he would show me what he typically looks for and how he goes about it. Inside Brick Row, natural light streamed through the windows, illuminating books sitting in cases along every wall and under windows, and on a graceful arc of shelves that ran through the middle of the shop. It was a quiet refuge from the city streets below, and if you ignored the computer and phone on Crichton's heavy, oak desk, it could be a nineteenth-century bookshop. Thousands of majestic leather-bound books, many with gold lettering, caught the light as I walked by. Given Gilkey's Victorian library fantasies, I could see why he favored this shop, why he chose to bring me there. Unlike Sanders's shop in Salt Lake City, Brick Row was tidy and appeared highly ordered. I got the sense that only serious collectors would venture inside, in contrast to Sanders's shop, where collectors mingled with people in search of a good used paperback (he offered a selection at the back of the store). The doors of the locked bookcases on the right-hand wall near the entrance had metal screens in a crosshatch pattern that made deciphering titles a challenge. These cases contained some of Crichton's more valuable books. A filmmaker would do well to use Brick Row as a set for a gentleman's fine library. "More classier feel than some of the other bookstores that just rack them up in average bookcases," is how Gilkey had described it. Crichton spoke from behind his desk. "May I help you?" His question seemed to ask much more. He was looking hard at Gilkey. "I'm not here to buy anything," said Gilkey congenially, "just to look around, if that's okay. We're just here to look." Crichton stood facing us. He was in his fifties with white hair, a ruddy complexion, and clear blue eyes. He had an assured air and seemed to be the kind of person who rarely had the wool pulled over his eyes. Gilkey referred to his list of the Modern Library's "100 Best Novels," and explained to me how he often looks for books on it. He pointed to the name Nathaniel Hawthorne. "Do you have any Hawthorne?" Gilkey asked Crichton. "I know he has one," Gilkey whispered to me. His comment was a hint at his antagonism toward dealers, which he had made plain in our prior meetings. 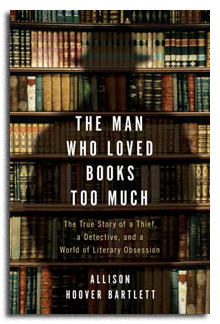 He'd argued that there was, in fact, widespread fraud among rare book sellers, fraud that made him not only blameless, but also a victim. One example Gilkey had cited was rebinding. Dealers, he explained, would remove the cover and title page from a second or later edition of a book, and then rebind it with a title page from a first edition that was in poor condition. "They make it look like a first edition, first printing," he said. "That's part of the fraud they do. That's actually legal." Later, I learned that there was nothing legal about this practice, but that it was not uncommon. The more expensive the book, the more likely it is that someone may have tampered with the binding. Such fraud is hardly new. In the eighteenth century, for example, facsimiles of pages, or "leaves," of ancient texts were sometimes created by hand and to near perfect effect. Of course, these efforts did not always go undetected, particularly when the pages were printed on eighteenth-century paper with an identifiable watermark. Even now, dealers come across pages of books that have been washed to give them a uniform appearance. Reputable dealers judiciously examine books for telltale signs of rebinding, but there are less upstanding dealers who don't. As we inched down Brick Row's bookshelves, Gilkey pointed to another book on his list, "Kurt Vonnegut," he said. "I'd like something from him, too. And D. H. Lawrence," he said. "He's also good." Crichton looked stunned and turned his back to us, then turned around again to face Gilkey. A few seconds later, while Gilkey was explaining to me which books he might like to look for, Crichton asked, "What's your name?" John—as though Crichton would be satisfied with a first name! I looked down at my notes while my heartbeat threatened to drown out everything around me. Crichton waited a moment, glanced down at his desk, then looked up. He didn't take his eyes off us as Gilkey pointed to various books and whispered, as one does in a library or museum, informing me about additional authors he was interested in: Vladimir Nabokov, Willa Cather. He commented that he stays away from bibles. "And who are you?" Crichton asked me.